Hummingbirds pay their respects to newly opened blooms in the garden, a blur of color against the green grass. The ground-level garden is strategically planted to discourage foraging by the ubiquitous deer. Sometimes they don’t chew, sometimes they do. The signs in Salt Spring nurseries declaring a plant deer proof are to be taken with a generous grain of salt. Bumblebees trundle across the expansive deck that is furnished with large pots, anticipating a feast once new plants open more faces to the sun. There is no shortage of bees on this island, especially bumblebees, and I wonder if pervasive organic gardening is at least part of the reason. We are busy planting pots of flowers on the actually deer-proof deck – at least I am happily serving as gardener and my sister as master planner as she recovers from hip replacement surgery. 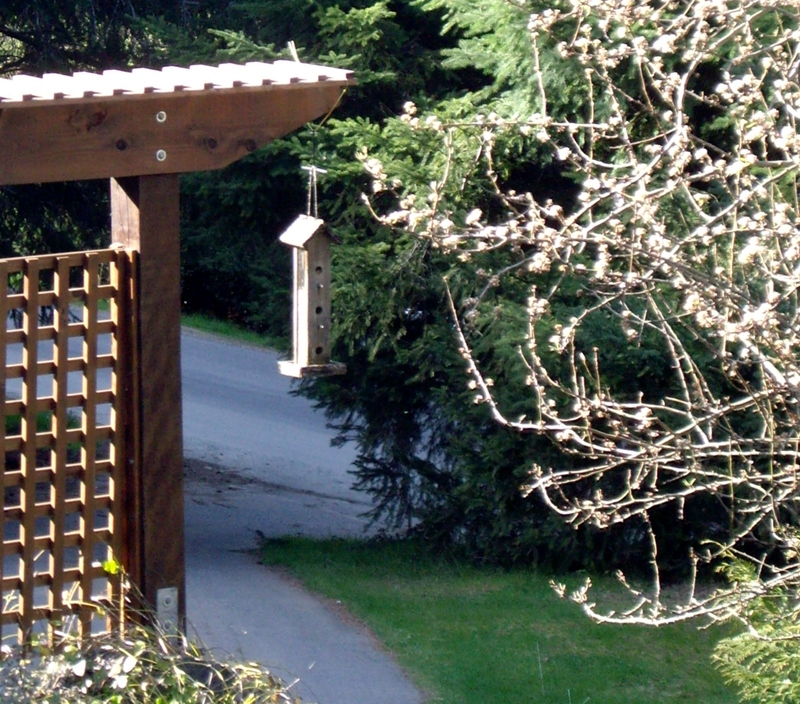 Nothing says spring like a bird house next to blooms! The day before, we had gathered up a bevy of potted lovelies at Thimble Nursery on the southerly side of the island, found at the end of a long, leisurely drive down a two-lane country road interspersed with farms set on rolling hills. Spring lambs in shades of cream, brown and black are a roadside delight in their pastures and I try to forget most of them will become delectable meals – island lamb is renowned for its flavor. At the nursery, a very mellow resident dog rambles up and leans against my leg with a sigh. He doesn’t move and as his warmth spreads into me, I imagine him saying, “Oh hi, I missed your leg so much.” I part company reluctantly – I could have sat down right there for a big hug. I love the color of this hydrangea on the deck. On the way home from the nursery we stopped at a roadside stand to buy a large bag of donkey manure for 2 bucks. A deal, as cow manure at the nursery was $6. 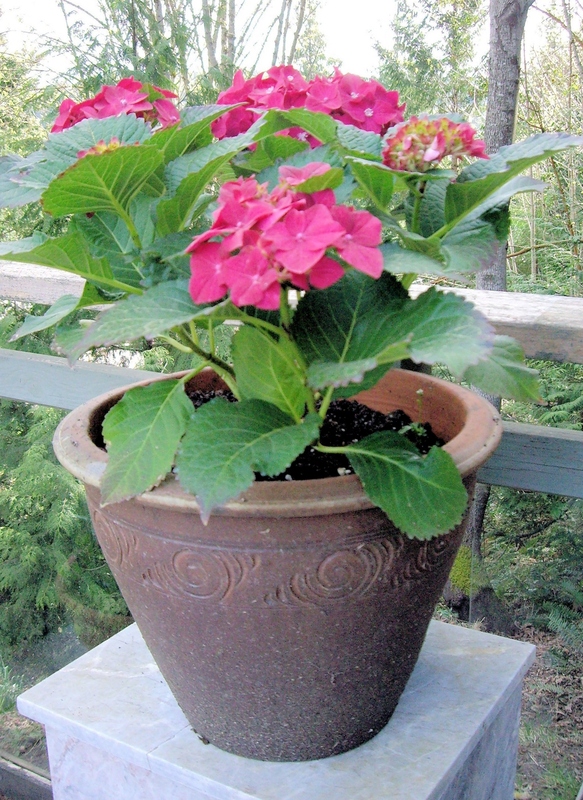 We need it to remediate the soil in the deck pots. I pop a toonie in the plastic yogurt container and heave on a bag. Nothing moves except my arm sockets. I set to dragging the bag to the car in stages, forcing my desk jockey body to obey. 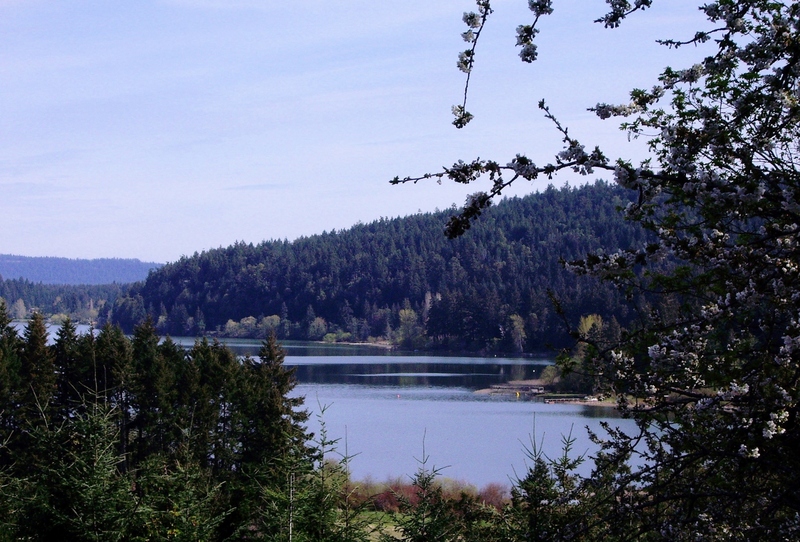 Once the deed is done, I am in the car, gasping and laughing with my sister, recalling days gone by when we were much more buff, able to haul around sundry items of heft. 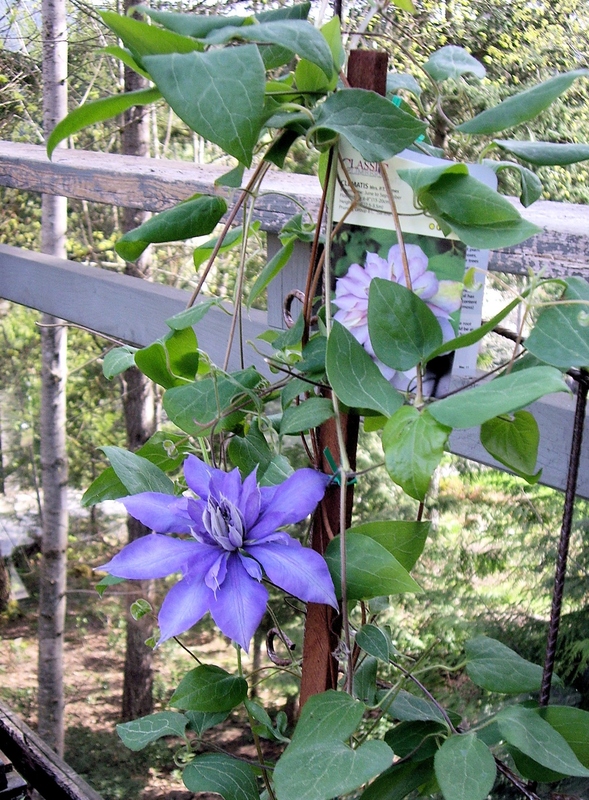 The new kid on the deck – a lilac clematis. This morning I am enjoying a cup of coffee with the last of my cherished hot-cross buns. They are among a collection of goodies that I cannot find in the U.S., including hermit cookies lush with nutmeg, allspice, cinnamon, nuts and raisins; Spartan apples, rather like old-fashioned Macintosh but a bit firmer and crisper and grown here in B.C. ; bread that is not loaded with salt and sugar; Eccles cakes; butter tarts and more. I make a mental note to be sure and bring home supplies to freeze as I take yet another photo of the lake’s many personalities. The morning complexion of St. Mary’s Lake.